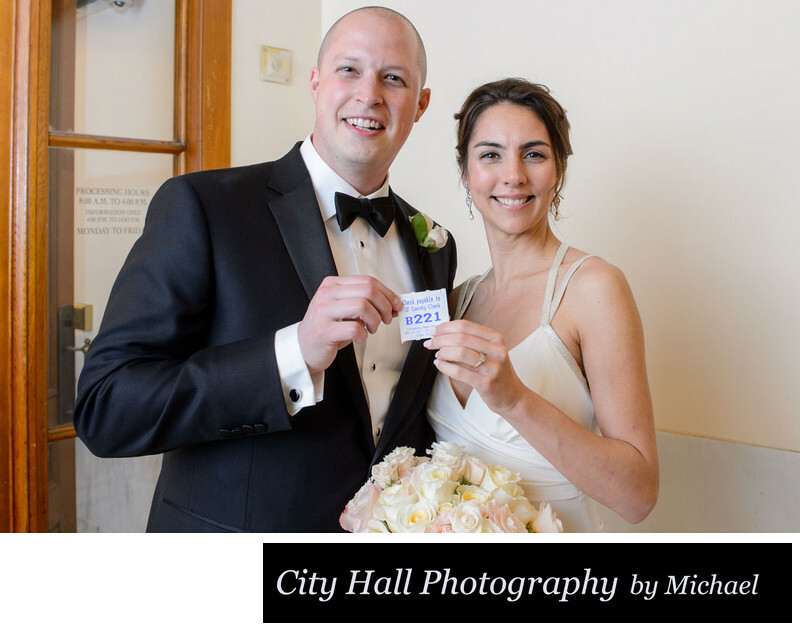 We thought it would be fun to explain how the whole San Francisco City Hall marriage check-in process works using photos. 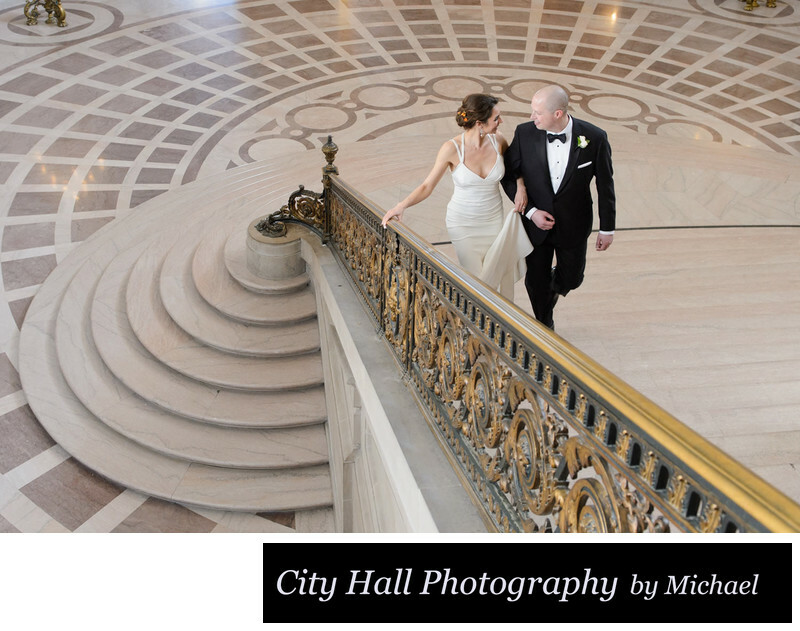 We have been photographing city hall weddings for years with over 350 ceremonies under our belts. One of the things that we always find interesting is the amount of confusion among couples regarding the ceremony check-in process. Some people think that the wedding is happening in the County Clerk's office and bring in their whole family. Others want to know how they get their ceremony number. Do they have to wait in line? Why are other couples walking around with numbers? What happens if you check-in too soon? What happens if you check in too late? When do we bring our witness? The questions go on and on. 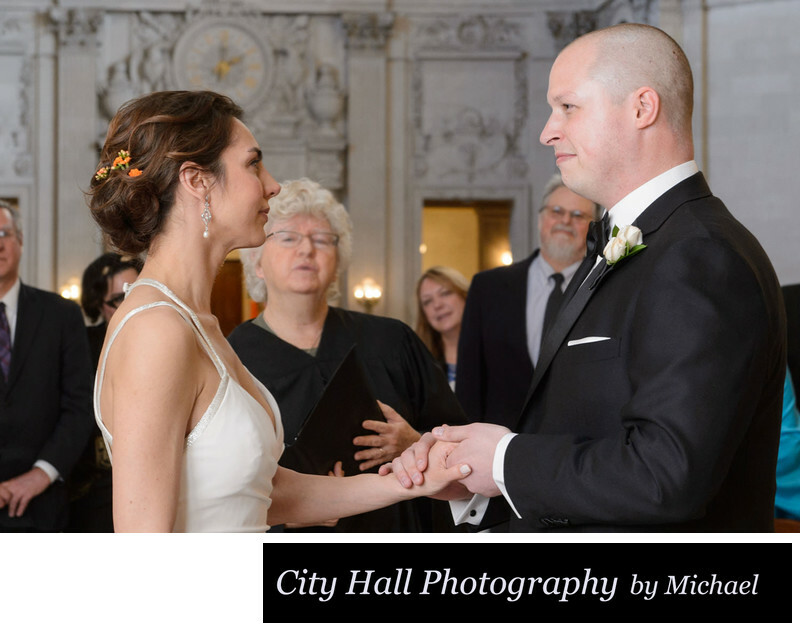 The couples that do all the right things and know where to go are inevitably accompanied by an experienced San Francisco City Hall Wedding Photographer. We feel (as do other photographers) that it is our duty to help make the day go as smoothly as possible for our couples, so we enjoy guiding them through the process. Is this a good reason for an engaged couple to hire a professional wedding photographer? Not really. Everyone manages to get through the process with or without help. But the couples who have hired a wedding photographer receive the added bonus of great wedding photos after the wedding is over! 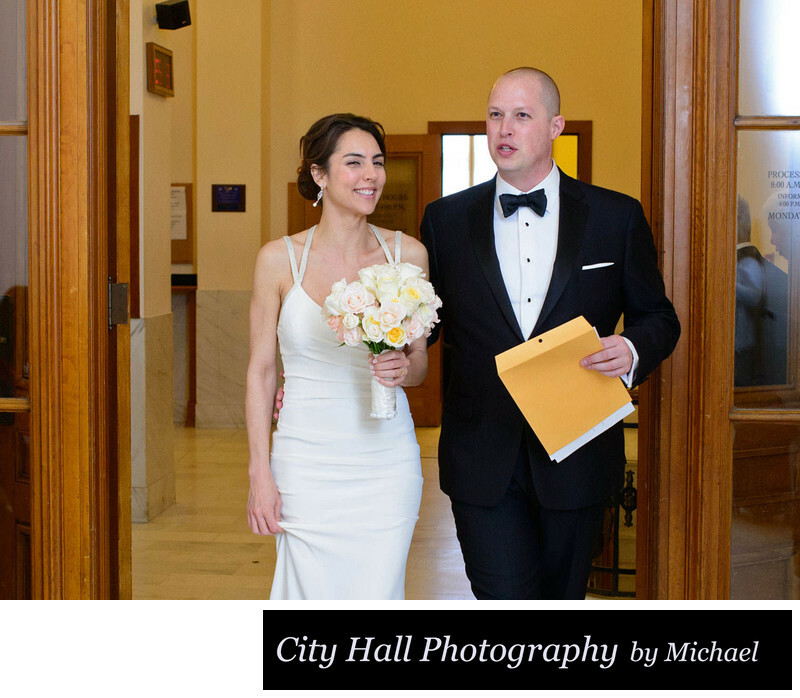 Step 1: Arrive at San Francisco City Hall and head to the County Clerk's office - Room 168. Make sure you have your Marriage License and current Identification documents. Passport, Drivers License or DMV ID all work fine. Allow plenty of time! Step 2: At about 10 minutes before your scheduled San Francisco City Hall ceremony, it's time to check in. You walk into the County Clerk's office at room 168 and show your Identification and Marriage License. The Clerk will check your paperwork to make sure everything is in order and then issue you a ceremony number. You then walk back into the hallway and wait for your number to be called. The couple checking in at the County Clerk's Office just before their wedding ceremony. Step 3: Wait for your number to be called and make sure your witness stays within reach. Depending upon how the day is going at San Francisco city hall, your number may be called almost immediately or it may take up to 20 minutes. We always recommend that the couple stick around, just in case their number is called suddenly. 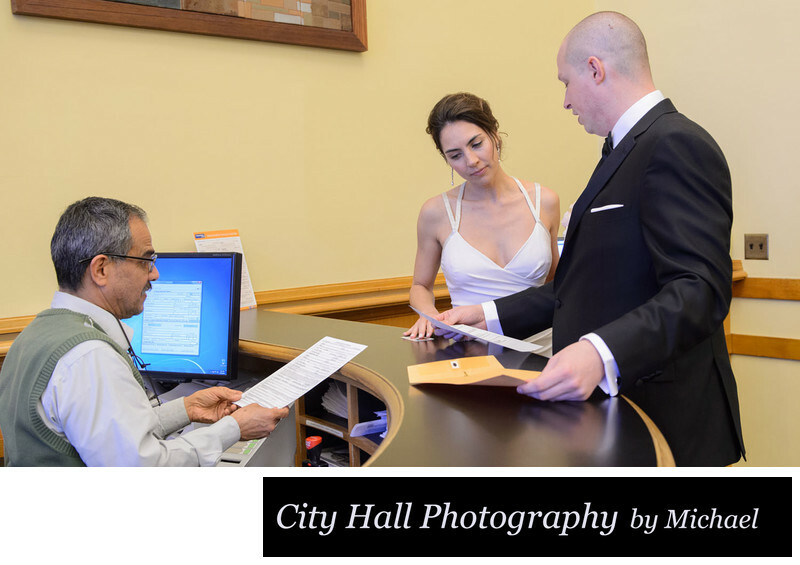 Once you hear your number, grab your witness and wedding photographer and head back into the Clerk's Office to meet your officiant to sign the marriage license. Step 4: Once your number is called, it's time to meet with your wedding officiant and have your witness sign the marriage license. The officiant will go over a few brief things with you and then ask if you are exchanging rings. She will then instruct the witness on the proper way to sign the marriage license. She will also ask you where you want to get married. The choices given are normally the Rotunda or the Private Room. Choose the Rotunda! 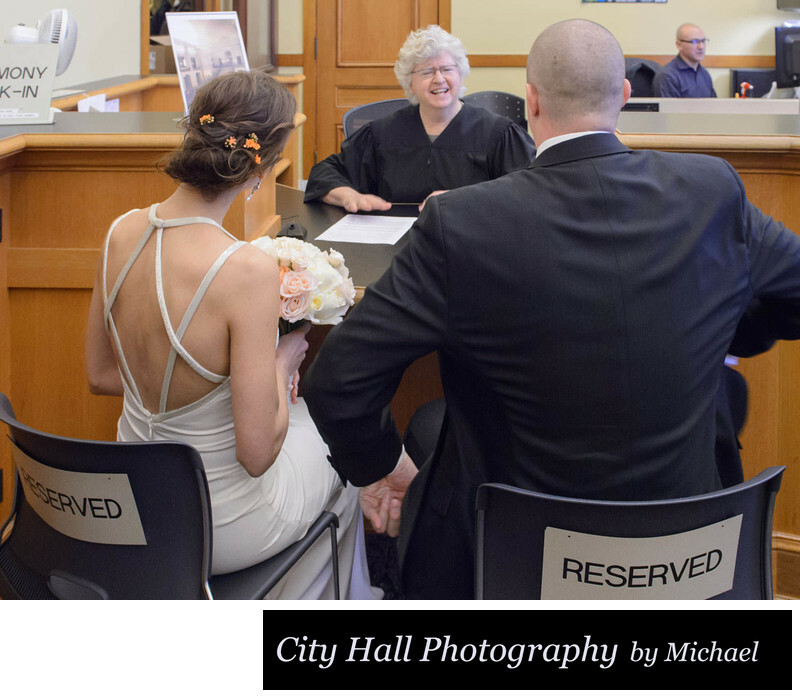 The bride and groom meeting with the officiant just before their San Francisco City Hall wedding ceremony. Step 5: Let's go get married! Walking out of the Clerk's Office with completed paperwork and ready to get married! Once you have gone through the entire process of checking in and meeting your officiant, the ceremony normally takes place in the Rotunda. As you can see below, the happy couple is exchanging rings during their short San Francisco City Hall ceremony. The bride and grooms nuptials take only about 4 minutes and then we move on to family photos and shots around the building. We take the newly married couple throughout the building once their ceremony is complete and get some great shots. 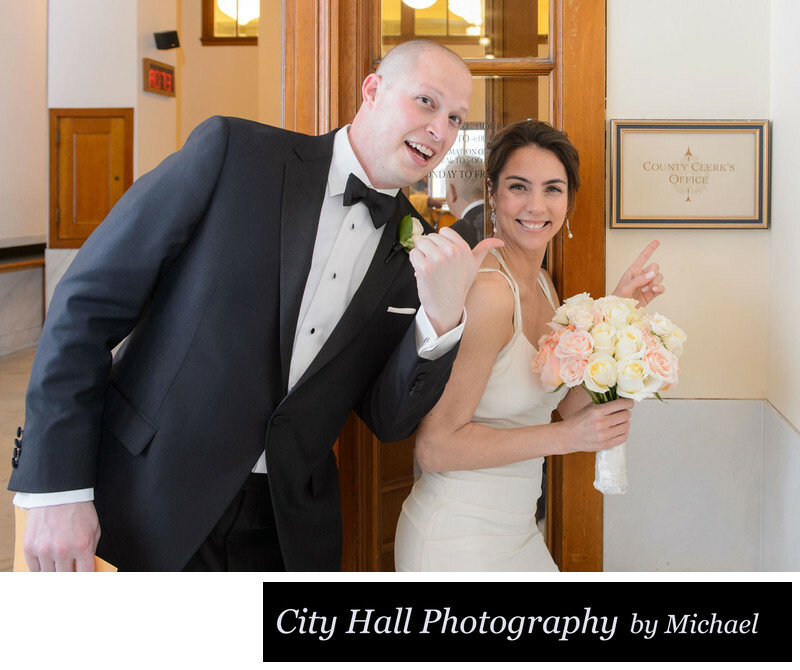 Your City Hall wedding is complete!